Starting in fall 2013, the Joint Department will offer a PhD in Biomedical Engineering with an emphasis on Pharmacoengineering, an emerging discipline that integrates engineering methods with pharmaceutical sciences. Pharmacoengineers apply the latest experimental approaches from life sciences, chemistry, and physics in conjunction with theoretical and quantitative methods from engineering, mathematics, and computer science to solve problems in medicine and drug therapies. Our program — a joint effort between the Eshelman School of Pharmacy Division of Molecular Pharmaceutics and the Joint Department of Biomedical Engineering at UNC-Chapel Hill and North Carolina State University — prepares students to work at the interface of engineering and pharmaceutical sciences to develop safer and more effective medicine and medical technologies. Note: Prospective students can apply to this program through either the Joint Department of Biomedical Engineering or the UNC Eshelman School of Pharmacy’s standard application websites. Upon completing their studies, they will receive a PhD from the program to which they applied. There is growing interest and need worldwide for PhDs at the cutting edge of this exciting discipline, in academic institutions as well as the biomedical, biotechnology, and pharmaceutical industries. Data from the American Association of Pharmaceutical Scientists, the primary national organization for the pharmaceutical sciences, indicate that at least three thousand positions exist for scientists with a PhD in the subspecialties represented by pharmacoengineering, and the demand for such scientists and engineers are rapidly expanding. 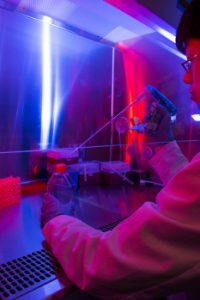 In addition, graduates from the Division of Molecular Pharmaceutics have traditionally been highly sought after — primarily by industry — and often receive offers of employment well in advance of finishing their degree. Our program is among the first of its kind in the country. It not only provides students with a strong knowledge base in both pharmaceutical sciences and engineering, but also a highly interdisciplinary research experience. Students have the flexibility to work with any of more than two dozen outstanding faculty members with expertise in a variety of fields within pharmacy and engineering. Our proximity to the Research Triangle Park offers ample research collaboration and employment opportunities for our students. Many of the research projects undertaken by students are highly collaborative, often involving joint work between pharmacy and engineering faculty and colleagues at the UNC School of Medicine, the UNC Department of Chemistry, or one of the many pharmaceutical companies and institutions in the RTP, such as GlaxoSmithKline, the U.S. Environmental Protection Agency, the National Institute of Environmental Health Sciences, and the Chemical Industry Institute of Toxicology.